Spraying sparks all over here! Eight young people, about 15 years old, meet seven adults beyond the age of 60. This creates an enormous area of tension, filled with prejudices, envy, curiosity and promises. This are the basics of vitality were Sabine Seume and Franz Mestre met. By means of dance and theater they get close to their prevailing viewpoint. Maybe this positions – in all their difference and in all, what they have in commen – are easier and even more directly to see as expected. 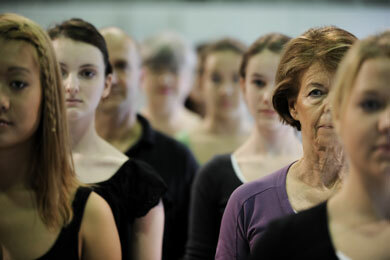 A production of tanzhaus nrw, in framework of “Miteinander leben” (living together), supported by the minister-president of NRW, the capital of the federal state Düsseldorf and the foundation of culture “Rheinenergie”.